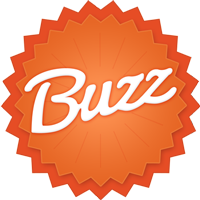 Today we’re really excited to announce the ‘Buzz’ version of Hively! We’ve had several customers request the ability for team members (employees) to give feedback to each other and to have that feedback be separate from customer feedback. Employees giving each other feedback is a great way to keep your team members motivated and get insight into how your team is working together. So we’re happy to announce that all of this is now possible in Hively with the new Buzz feature! 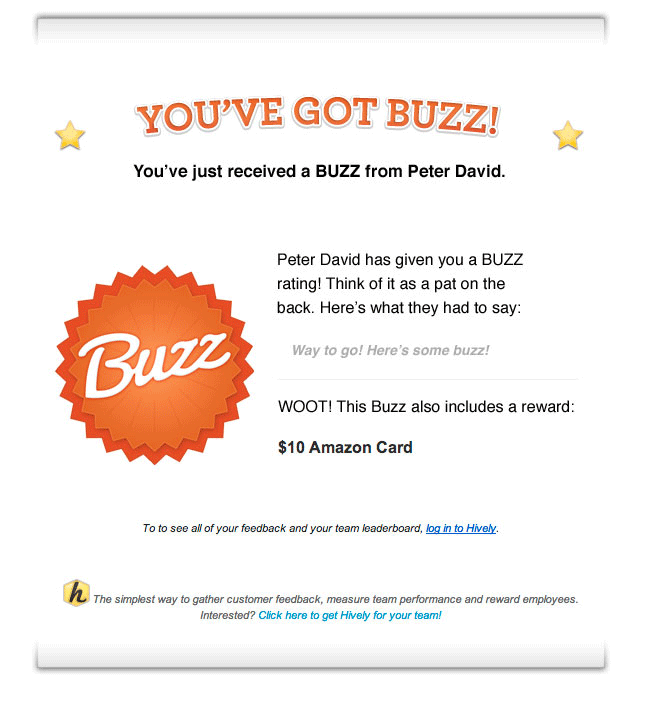 Just like with Hively customer feedback, if you receive a Buzz you will be instantly notified and have the Hively Buzz badge prominently displayed on your leaderboard profile for your team to see. You will also receive +1 count for each Buzz you receive. Buzzes are separated from customer feedback and don’t effect your customer happiness scores. Gift Card Incentive Rewards with Tango Card! But we didn’t stop there! What’s better than getting a Buzz? Getting a Buzz with a gift card reward! We recently partnered with Tango Card to enable our customers to provide real time rewards to top performing team members. Tango Card provides virtual gift cards that can be redeemed for cash or other gift cards like Amazon, Starbucks, Nike and Zappos. 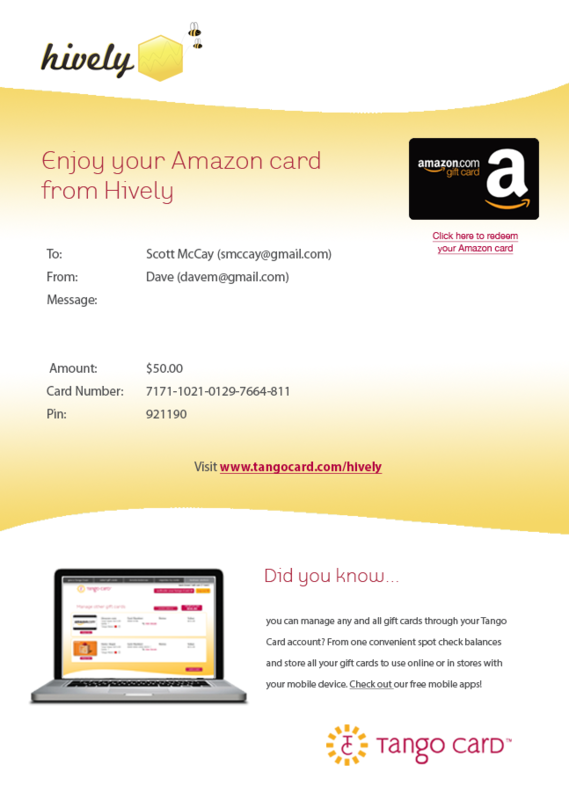 If you’re a Hively team member, simply sign up with Tango Card and you can start adding gift cards to any Buzz you send your team members. 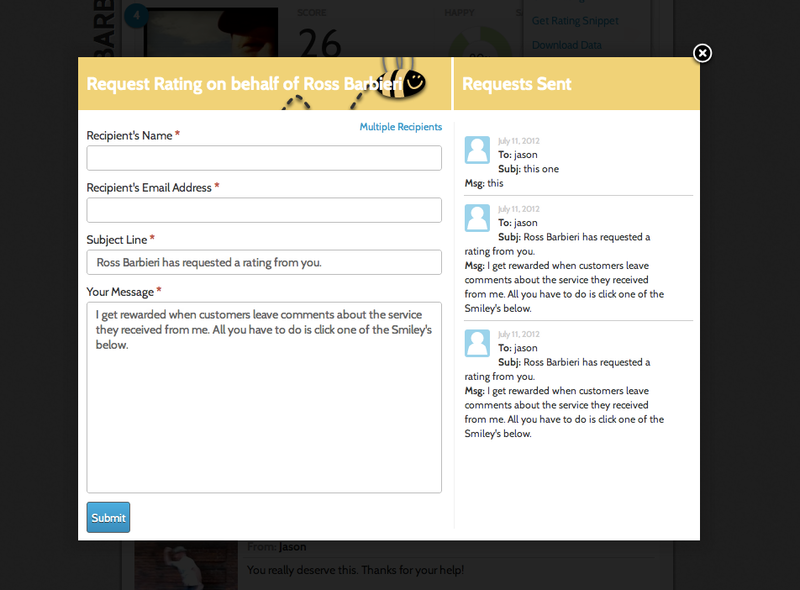 Hively lets you request customer feedback directly through the application with the ‘Request Rating’ feature. Think of this as essentially a one question survey you can send to single or multiple customers. Well now this feature is even better with templates. Each time you request a rating the request will be saved. To see requests you’ve sent previously or to send the same ore similar request, simply click on the previously sent request, change or edit anything necessary and send again. Simple! We’ve also simplified our subscription plans for Hively. Instead of 5 different pricing plans we now have only two – Free and Premium. Free plans provide for up to 3 team members and a limited feature set within Hively. This option is great for smaller teams or for teams wanting to try Hively. The Premium subscription plan provides for unlimited team members and the full set of Hively features. 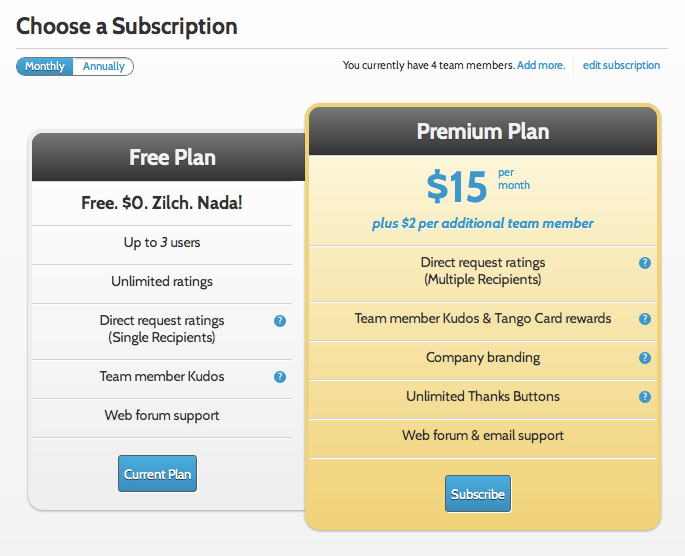 The new pricing for the Premium subscription plan is: $15/mo + $2/team member. You also now have the option of signing up for annual pricing and getting a 10% discount for doing so! Sign up and choose the right plan for you. Thanks again to all the customers that provided us with feedback to help make this release. There are many other updates inside of Hively as well but we’ll let you have the fun of discovering them instead of listing them all out here. Let us know what you think of the new improvements to Hively. As always, if you would like to send us feedback or give us your feature ideas we’re always ready to listen. Congrats guys, this is a great idea. I love where you are taking this! Kudos! Har har….